I just got back from a transformative four weeks in Ghana, West Africa! It was jam-packed with extraordinary adventures that I’m just starting to digest! Here’s a fiber related one. It will probably take a few installments. Nearly everywhere in Ghana are women (often carrying large loads on their heads and babies on their backs!) wearing boldly colored batik dresses and head wraps. I tried not to stare but the intricate fabric designs, the complicated cuts of the dresses AND the ingenious way yardage was skillfully used to secure those babies was a visual treat. Some of that fabric was cheap fake batik imported from China. But I sought out where to buy locally made batik. I had been given the name of Mercy Asi Ocansey from a friend as the place to see the most beautiful and interesting hand made batik in the area. I finally found both she and her small shop in Accra, the capital of Ghana. 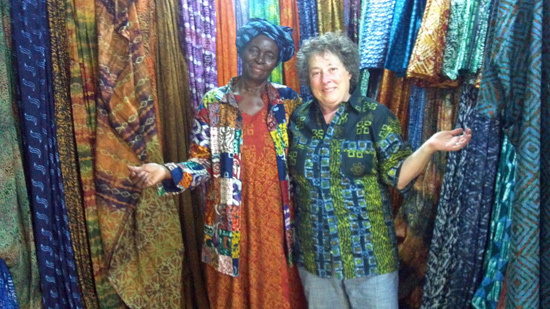 She is retired and the designs and fabric are now being created by her son, Daniel Tekper Baflo (much more on his amazing craft later!) She asked me to wear one of her batiked shirts for the picture. This photo does not do justice to the multilayered unique designs on all this fabric. Needless to say I left with a lighter wallet though it was agonizing to pick what yardage to buy. I returned a few days later to work out a plan to be able to observe her batik workshop (outside of the city) and create some fabric myself. This involved lots of misunderstood English, laughter, many cell phone calls to “the boy” (her son, Dan) and polite price haggling. My friend and I left with very rough directions and a plan to travel there the next morning. I also, of course, had bought more fabric : ). More in the next installment! This entry was posted on August 27, 2013 at 8:55 am and is filed under Dyeing, Inspiration, Process, Uncategorized. You can follow any responses to this entry through the RSS 2.0 feed. You can leave a response, or trackback from your own site. What a fabulous experience this must have been. Your work is so inspiring.